How should I clean my carpet to use it for long years? How should I clean my carpet to use it for long years? A vacuum cleaner must be used to clean areas with high traffic on a daily basis and professional cleaning is required for longer periods. A vacuum cleaner must be used to clean areas with high traffic on a daily basis and professional cleaning is required for longer periods. During the cleaning, hard impacts like beating or whisking as well as harmful chemicals must be avoided. Vacuum cleaner must be used in parallel to the carpet hair in slow motions. Stains and spills on the carpet can be avoided if intervened in a timely and proper manner. The stain must be sucked with the smallest nozzle at the highest suction level or the excess part must be removed with a hard spoon or non-sharp knife, or cleaned with the stain removers recommended in the use guide depending on the type of the stain to be rinsed afterwards. Excess humidity must be taken with a vacuum cleaner or by stippling with an absorbing cloth. otherwise the part remaining humid and/or shampooed will keep the dirt. Use of too much shampoo and water must be avoided during cleaning. If stain remover must be used, try it first on an invisible part of the carpet. When selecting the cleaning materials, do not choose brands with vague contents or lacking warranty of a serious firm. Most of simple stains can be removed with a quality carpet shampoo. At the end of the cleaning, the fluffs must be brushed in a way they stand upright. Never wash the carpets. If washed or became wet in a way whatsoever, it must be dried in a fast and proper manner. 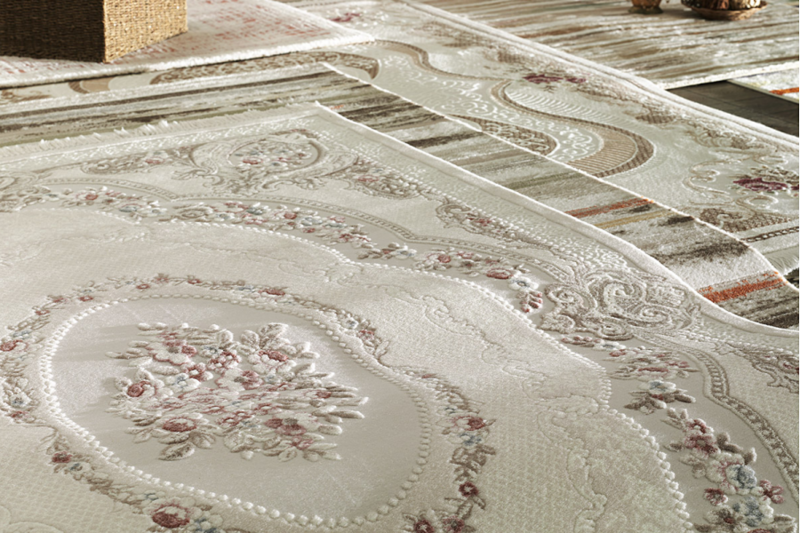 The consumer may not claim any rights for deformations due to washed or flooded carpets. Furniture's places must be changed from time to time in order to prevent parts under the furniture getting crushed, and a pad must be placed under sharp feet. The carpet must not be exposed to direct sunlight for prolonged periods. It must be kept away from harmful high temperatures from heaters, radiators, etc. The fluffs and poufs of the carpet must be in parallel to the human traffic in the area where it is used. Shading: It is not a manufacturing-related fault. The optical light illusion on the surface of the carpet due to unlevel floors often results in shading. This shading seen in rare occasions is not a manufacturing-related fault and not included in the scope of warranty. It is inevitable to see differences between the used and unused parts of the carpet regular maintenance delays the emergence of this appearance. It is normal that some fluffs might come off depending on the type of raw materials. This will reduce in time with regular vacuum cleaning. It must be noted that there are products with fluffs not coming off when designing the products. It is not possible to produce a fully stainless carpet. Deformation in color or carpet surface will be inevitable if immediate and proper action is not taken when any staining material spills on the carpet.